The ASICS athletic back catalogue is one of the best of any brand and it’s a place that’s strewn with amazing shoes deserving of a reissue. Honestly, between 1987 and 1991 we’re not sure that ASICS put out a bad looking running shoe — naturally, some shoes are better than others, but that’s to be expected and we never thought we’d see the GT-Cool back again in its 1991 form. This design was originally released as a high-mileage runner with Gel cushioning and it has the split-tongue too (it’s worth noting that the Gel Exult was the original ASICS split tongue shoe and not the Gel Lyte III, though the latter is a far more innovative design). 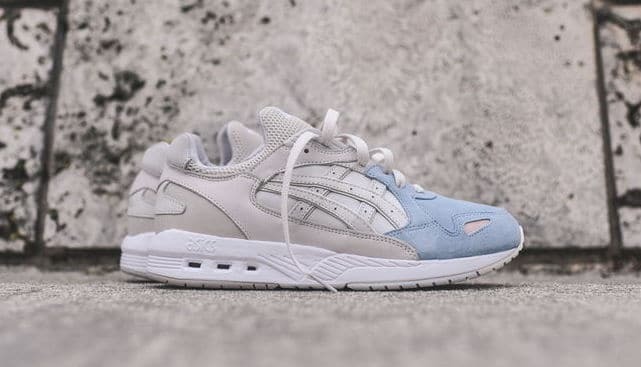 We really like the exposed foam midfoot on this shoe and ASICS have scrapped synthetic suede in favour of the real deal, with the breathable, perforated side panels (which we believe gave the shoe its titular cool) made of nubuck. If this one looks different to the GT-Cool you remember that maintained the legacy set by the X-Caliber and Ultimate GT of the early 1980s, you might be thinking of the sequels to this silhouette — 1992’s GT-Cool Xpress with its visible rear foot debut of the unimaginatively named Super Gel (which hasn’t aged too well) and the GT-Cool X with visible Gel at the rear of the outsole (which has aged very well). Both these simple, solid makeups of the GT-Cool will be online shortly. They’re not the stuff of hyperbolic hash tagging, but there’s something appealing in those hype free, function-led looks nonetheless.